The paleoclimate record holds a unique source of information about natural drought variability. From paleodata, we know that the 20th century (instrumental period) does not encompass the full range of potential droughts in most regions and that longer, stronger “megadroughts” are a feature of natural variability. This provides important knowledge for planners and decision-makers, allowing them to address the full range of potential water shortfall that may occur. Paleodrought data also offer a “testbed” against which drought simulated by climate models can be compared to assess model capabilities. Our project includes a strong paleo-drought component so that the full range of potential drought variability is incorporated. Paleodrought data comes from many diverse sources, depending on the region. Each type of paleodata has its own strengths and weaknesses. 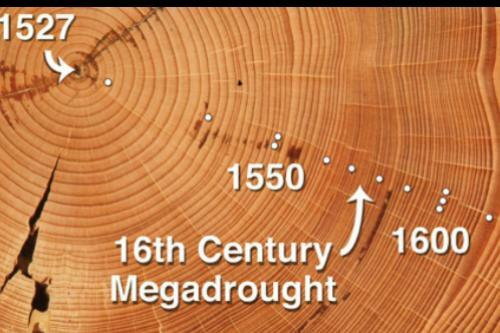 For example, southwestern North America is well covered by tree-ring records (image below by Dan Griffin), which provide annually dated reconstructions of moisture conditions, often specific to a single season. But tree-ring data emphasize the interannual decadal variations and may be less sensitive to long-term changes, due to often-unavoidable statistical processing. Other regions lack abundant tree-ring data, but may have records from caves (above photo by Luke Parsons) and/or lakes (e.g. monsoon Asia, Australia, the Amazon, west Africa, Caribbean). These types of data lack the annual precision of tree-rings, and are often less firmly calibrated, yet they contain robust markers of hydroclimate and can extend back millennia, with decadal or interannual resolution. This project leverages a wide range of research at UA to tap into both published and in-progress records, with an emphasis on combining data from diverse sources to get the strongest possible drought reconstructions across a range of time scales.